If you enjoy a good cuppa tea, you’ve come to the right place. While the bucket list for visitors has long included the opulent afternoon tea at the Fairmont Empress Hotel, Victorians have also taken tea to a new level, with everything from regional noshes and trendy tea services to tea-infused cocktails. I first discovered the fresh, grassy notes of rare White Jade Phoenix and sipped soothing Winter Warrior wellness tea while perched at the sleek bar at Silk Road Tea in Chinatown. Both are the inspirations of modern tea master Daniela Cubelic, a kind of tea savant who has changed the way we look at the world’s most popular beverage. “Tea is now a North American phenomenon, but we were well ahead of the curve here,” says Cubelic, who began her quest to share the world’s finest teas 25 years ago. And you’ll find her mark on many menus around town, whether it’s a tea-based Serenity cocktail at Veneto Lounge, a tea-flavoured ice cream at Cold Comfort or a seasonal beer like Nut Brown Ale with Silk Road chai tea at Spinnakers Brewpub. Mix in the cool, wet coastal weather, and you have the perfect climate for a tea revolution. No wonder we have so many great places to take our tea. At pretty Venus Sophia Tea Room in Chinatown, Sallie and Alain Alaily are laying their own cultural experiences over the afternoon-tea experience. With his Swiss chef training, her Egyptian heritage and their mostly vegetarian lifestyle, they bring a unique twist to the traditional teatime offerings. “We’re promoting the healthier side of high tea, but it doesn’t have to be bland or boring,” says Sallie, offering a mushroom-paté sandwich laced with the heady aroma of truffles, and a pretty cream-cheese pinwheel studded with caramelized grapes, from a three-tiered afternoon-tea tray. “We create our own tea blends and we love to cook with tea,” she adds, passing scones flavoured with chai tea and a tiny vegetarian quiche that gets its smoky, bacon-like note from a touch of Lapsang Souchong. Like fine wine or single malt whisky, tea has terroir and you may need an expert — a tea sommelier — to help you choose the best teas to match the sweets and savouries traditionally served alongside. Sallie is studying to become a certified tea sommelier. At the Hotel Grand Pacific, server Timothy Cooper is well versed in tea, too, with advice on pairing their curated collection of rare, loose-leaf teas with chef Takumi Kitamura’s exotic, Asian-inspired menu. Think braised daikon, grown on nearby Umi Nami farm, with caramelized onions, quenelles of golden organic-egg salad perched on squares of savoury rye-and-smoked-salmon bread pudding, plus sweets like praline profiteroles and vanilla-bean scones — a unique West Coast Afternoon Tea experience. The Jasmine Pearl that Cooper pours into a small porcelain cup is refreshing and smooth, almost buttery on the tongue, while the Earl White offers the aromatic essence of lemongrass and bergamot in a delicate white tea. “Green tea and oolong go with food best because, like wine, they are fresh and palate cleansing,” Cooper explains, giving me a lesson in sipping from a traditional gaiwan, a single leaf of Dancing Monkey Tail unfurling in my cup. Beyond the Empress, there are other good spots for the traditional English-style tea, too. At the White Heather Tea Room, you can opt for the Big Muckle Giant Tea for Two or just a Wee Tea with tea sandwiches, a little scone and selection of their house-baked sweets, including a wedge of Scottish-style shortbread, baked according to the original owner’s family recipe. Or take your tea at The Teahouse overlooking the stunning and serene Abkhazi Garden. Tea is comforting, soothing, stimulating and social — unlike an espresso to gulp at a busy coffee bar, there’s a relaxing ritual around serving tea. Part of that ritual is elegant tea ware, from the vintage china at Venus Sophia to jewel-toned cast-iron pots lined up along the bar at Silk Road. Cubelic says form perfectly meets function in these colourful Japanese vessels — the iron holds the heat while the wide, shallow shape increases the surface area, for evenly brewed and tastier tea. The tiny flared porcelain cups that offer barely a single sip are part of the tea connoisseur’s kit, too. “The type of vessel is more important when the flavours are more subtle,” she says, explaining how a small cup encourages slow sipping and delivers the tea to a specific spot on your tongue. 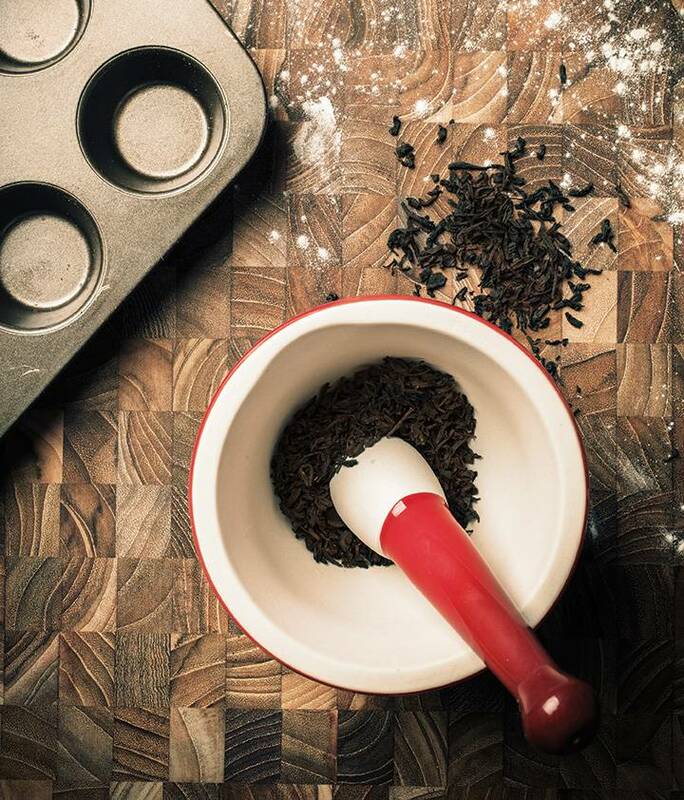 With coffee so fast and ubiquitous, it can be difficult to take the time to make tea, but Cubelic says that’s exactly why we should. “Ironically, that’s the beauty of it — tea forces you into a ritual that requires you to slow down,” she says. “And it is these moments, taken outside of our stressful days, that help us to pause and focus and be present. This recipe, from chef Alain El Alaily at Venus Sophia Tea Room, uses no bacon but gets a similar smoky flavour from the smoked Lapsang Souchong tea used to season the filling. 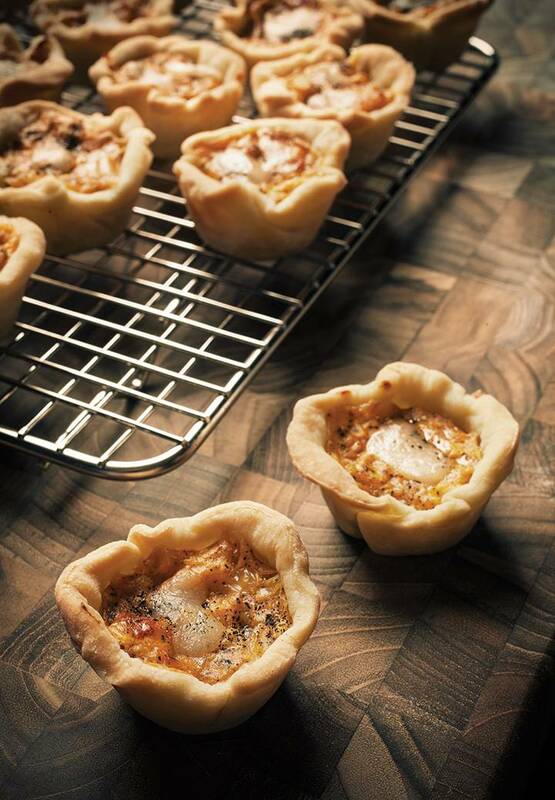 Make pastry from scratch, or use frozen mini tart shells. To make the pâte brisée, place the flour, salt and butter into a large bowl. Using a pastry blender, cut the butter into the flour until the mixture is crumbly. The butter should be cut into pieces smaller than a pea. Add the water, a tablespoon at a time, and mix quickly with a fork, just until the pastry begins to come together. Dump it out onto a piece of plastic wrap and gather into a ball. Wrap well and flatten pastry into a thick disk. Refrigerate for an hour or two to chill the pastry before rolling. Meanwhile, place the tea in a blender or spice grinder to create a fine powder. Set aside. Cut the baked yam in half and spoon out the flesh. Discard the skin. To make the filling, in a blender combine the cooked yam, egg, cream and flour. Add 1 teaspoon of ground Lapsang Souchong tea and the salt. Blend well to create a smooth base. Add 3/4 cup of cheese and pulse to combine. Don’t purée. Roll out the pastry on a floured surface until about 1/8 inch/3 mm thick and cut into three-inch rounds using a glass or cookie cutter. Press the pastry rounds into a mini muffin/quiche pan, and fill each three-quarters full of the prepared filling. Bake in a preheated 375°F oven for 15 minutes. Cool. Just before serving, top each with a little of the remaining shredded cheddar and a sprinkling of the ground tea. Bake at 400°F for 3 to 4 minutes, just to heat through and melt the cheese. Serve warm. Makes 24 mini quiches.